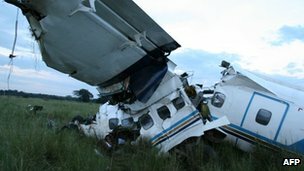 22 August 2012; Mombassa Air Safari; Masai Mara Game Reserve, Kenya, Let 410; 5Y-UVP: The aircraft was on an unscheduled domestic flight, and crashed shortly after takeoff. Both crew members and two of the 11 passengers were killed. This airline had a previous Let 410 crash in 1998 that killed both pilots. That accident flight had no passengers on board.